Purchasing Management’s optional payment approval process provides a way for individual approvers to verify received invoices are correct and ready to pay. 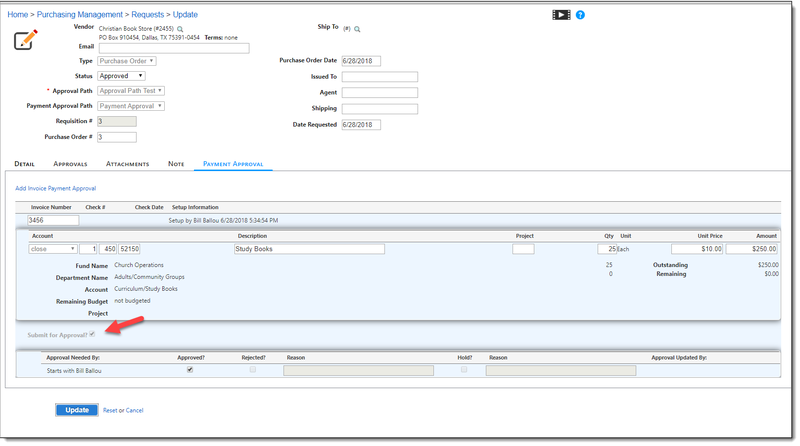 Once verified, the invoice number of the invoice is available in Accounts Payable’s invoice # drop-down field. Selecting an invoice number will cause the program to complete the invoice entry. To activate the optional payment approval feature simply hover over Modify and choose Company Information. Place a check mark in the "Use Payment Approval Process" field. After activating the feature, hover over Modify and choose Approval Paths. You can use any existing approval path for payment approval or create new approval paths. Simply place a check mark in the "Use for Payment Approval Path" field on existing or newly created paths. Upon receiving an invoice for a previously approved purchase, an approver needs to begin the payment approval process by locating and opening a previously approved request. Hover over Manage and choose Requests. Choose the proper "Payment Approval Path". Click on the "Payment Approval" tab then click the "Add Invoice Payment Approval" link. Select to close or leave the purchase order open, then enter the "Invoice Number" and modify any of the existing information that needs correcting. Click the "Submit for Approval" field that will then either send to next approver, or complete the payment approval process.